Preheat the oven to 160C fan forced (180C without fan). Heat a large (minimum 3L/12 cup capacity) lidded flame-proof/oven proof casserole dish over a medium high heat with half of the oil. Once hot, add the chicken in batches, cooking for 3 – 4 minutes on each side until golden. Transfer the chicken to a plate while you cook the remainder. Remove the excess oil from the pan and then return to the heat. Add the remainder of the olive oil and then add the bacon and cook for a few minutes until it starts to go golden, then add the leak and cook for a few more minutes before adding the garlic and mushrooms. Cook until golden brown (around 5 minutes). Once the vegetables are golden, add the flour and cook for a minute, stirring constantly. Then add the wine and allow it to come to the boil for about a minute to get rid of the alcohol. Then add the stock and thyme and bring back to the boil. Once the liquid has come to the boil, return the chicken and any juices to the pan. Cover and bake in the oven for 1 hour or until the chicken is cooked (any juices will be clear when pierced). I like to give it a mix half way through this time to ensure the chicken cooks evenly. Remove the chicken from the casserole dish while you finish the sauce. Place the casserole dish back onto the stove-top over a medium high heat and add the cream and frozen peas (if using). Bring to the boil and allow to cook for around 5 minutes or until the sauce has thickened slightly and the peas are cooked. 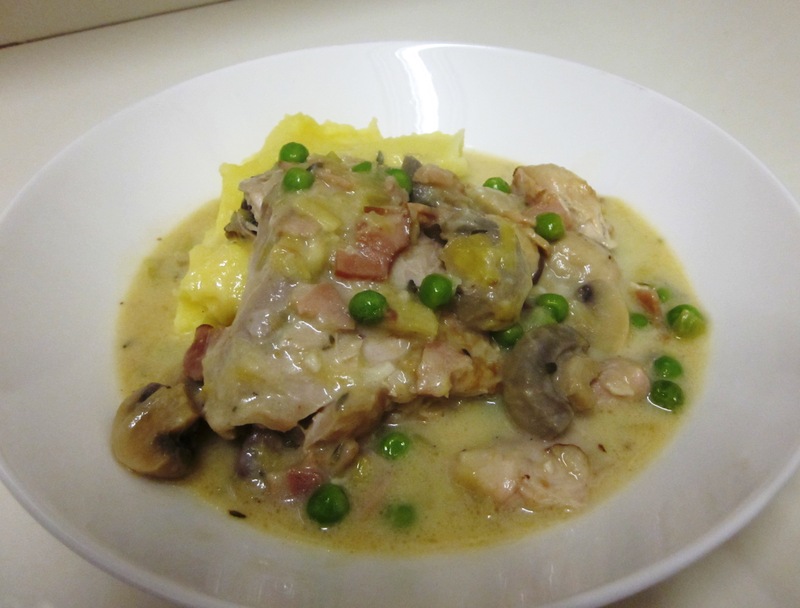 Serve the chicken with mash potato and top with the sauce. Alternatively, shred the chicken and return it to the sauce before serving with mashed potato or pasta. Tip – I prefer to make my mash potatoes by steaming (using a stainless steel steamer over a medium saucepan of boiling water covered with a lid) them rather than boiling them, and then passing them through a ricer before adding to milk and butter (or margarine). I find this gives the the creamiest potatoes and is also quite quick. 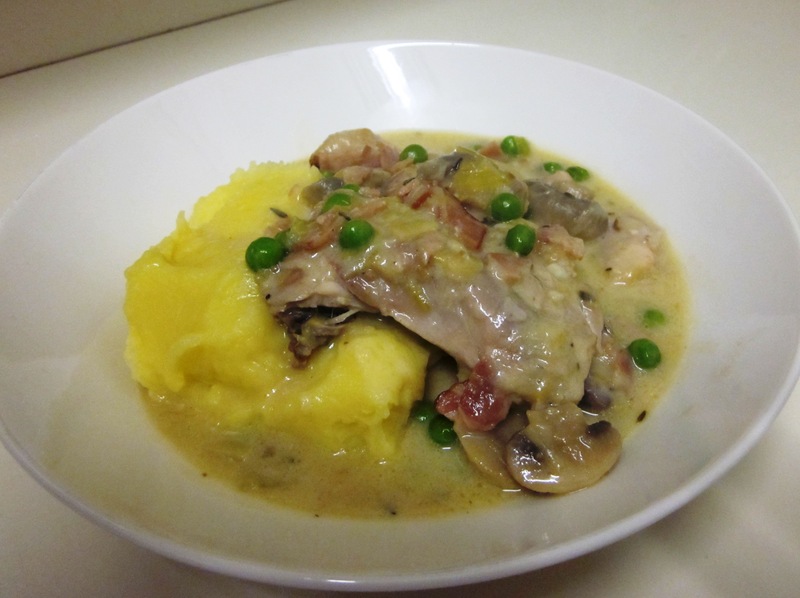 Adapted from taste.com.au Chicken, leek and mushroom casserole.